S.S. Punched grid Resistance Boxes are designed to meet requirements of A.C & D.C. application for E.O.T. Cranes, Winches, Rubber Mills, Flour Mills, Coal Mines, Cement Mills, Power Plants, Conveyors, Coke Oven, Blowers etc. for Speed control and developing Starting Torque. S.S. Punched grid Resistance Boxes consist of Grids Punched from Nickel Chromium Steel Alloy Sheet. These grids are shock and vibration proof. 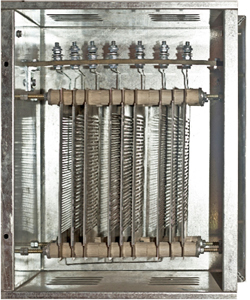 These resistors are specially suited for Steel mill duty. Coal mines etc. These resistors are available in a wide range of Current ratings from 7 Amps to 800 Amps continuous. The series connection between adjacent grids is by means of copper jumpers. The resistors, after overloads of moderate duration become red hot but no damage is caused and retains their shape after overload disappears. Supplier of Resistance Box and manufacturer of Resistance Box. Pethe Industrial Marketing Company Pvt. Ltd. is the leading manufacturer of Resistance Box in India. Pethe Industrial is the leading supplier of Resistance Box in Mumbai, Maharashtra, Gujarat, Delhi, and all over India. • Body material is made of GI Sheet. • Enclosure is of IP-44 degree of protection. • Mounting position is on Floor. • This boxes are air cooled. • Sugar, Mining, Cement, Textile industries to name a few.